WASHINGTON, DC, February 4, 2009 (ENS) - The range-extended electric Chevrolet Volt has been named the 2009 Green Car Vision Award winner by the auto magazine "Green Car Journal." The award was presented at a press conference this morning at the Washington Auto Show. The show opened to the public today at the Walter E. Washington Convention Center and runs through Sunday. Competition for the Green Car Vision Award was keen, with plug-in hybrid, range extended electric, battery electric, and hydrogen fuel cell vehicles all in the running. "The Chevy Volt offers a bold and far-reaching approach that will bring an exceptionally fuel efficient model to consumers at reasonable cost," said Ron Cogan, editor and publisher of the "Green Car Journal" and editor of GreenCar.com. Unlike traditional electric cars, the Chevy Volt has a propulsion system that uses a lithium-ion battery with a gasoline-powered, range-extending engine that drives a generator to provide electric power when drivers go beyond the 40 mile battery range. "Besides being a great design, the Volt promises exactly what many consumers are asking for - a car capable of driving on zero emission battery power most of the time at pennies per mile, with over 100 mpg possible on longer journeys when electric power from its range extender engine generator is needed," said Cogan. General Motors is hustling to bring the Volt to market next year. Over 200 engineers and 50 designers are working on the Volt and another 400 are working on related subsystems and electric components, says Tony Posawatz, the vehicle line director at General Motors responsible for the Volt. The Green Car Vision Award recognizes the most important vehicle in an award year that best envisions the road ahead, but is not yet on sale. It complements Green Car Journal's Green Car of the Year award, which focuses on new vehicle models that lead the field in environmental performance and are now available at new car showrooms. The 2009 Volkswagen Jetta TDI was named Green Car of the Year in November, the first time that a clean diesel model has won the title. 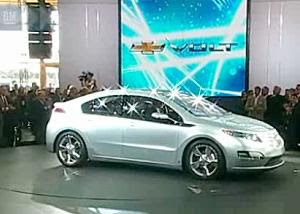 The Chevy Volt won the Green Car Vision Award over other innovative models that Cogan says each also promise to share in the future green car market. Fisker Karma: The brainchild of auto executive and designer Henrik Fisker, the Karma features a plug-in hybrid powertrain by joint venture partner Quantum Technologies. It is launching later this year. Honda FCX Clarity: The FCX Clarity is a hydrogen fuel cell sedan currently being driven by consumers in an evolving demonstration program. MINI E: This zero emission vehicle is an electric version of the conventional internal combustion MINI Cooper. About 500 MINI Es now are being leased in three states as a way to gauge the market. Mitsubishi i-MiEV: The i-MiEV is a battery electric city car based on an internal combustion model already popular in Japan. Examples are being tested in a demonstration program with Southern California Edison and Pacific Gas & Electric Co.
On Monday, Carol Browner, special assistant to President Barack Obama for energy and climate change, got a personal showing of the Chevy Volt from Ed Welburn, the chief designer for General Motors. "I found the Volt to be very comfortable - and surprisingly simple," Browner wrote on the White House blog. "You plug it in and you can get 40 miles on a single charge! Because nearly 80 percent of Americans commute 40 miles or less a day, this car could potentially provide 80 percent of Americans with a zero-emissions option for their commute." A former administrator of the U.S. Environmental Protection Agency in the Clinton administration, Browner was welcomed to the show by Auto Alliance CEO Dave McCurdy, who stressed the importance of green technologies and green jobs in the auto industry. "This kind of innovation and shift in design is key to the renewed success of the American auto industry," Browner blogged. "We saw the new Ford Fusion," she wrote. "This is another example of a technology that will benefit from funding for battery investments in the American Recovery and Reinvestment Act - the kind of forward thinking that we ought to be encouraging and supporting." Passed by the House of Representatives last week, the Obama administration's multi-billion dollar American Recovery and Reinvestment Act is being debated in the Senate, with a vote expected on Friday. "The technology is there. And the demand is there," blogged Browner. "And now, in the face of our dangerous dependence on foreign oil and a faltering economy, there is urgent need to support the industry and nurture this kind of development. That's why passage of the American Recovery and Reinvestment Act is so crucial - because it brings significant resources to develop new and emerging green car technologies as well as tax credits for consumers to purchase new advanced technology vehicles."